Well, friends, I`m going to talk today about Croatia. The small state in the South of Europe. When I decided to visit Croatia, the first thing I did was to buy a map. And of course, look at it. And, boy, I did look at it! First of all, let us imagine the shape of this country, let’s imagine a long coast, but long! Something like 5,835 km of coastline (don’t freak out, I’m including the hundreds of islands, too) along the Adriatic Sea. To be more precise, there are 1,185 islands, but only 50 inhabited. I personally loved the islands. From Pula (the Western part of Croatia), I took a small cruise (quite cheap, 25 euro – meal and drinks included, plus a bath in the Adriatic Sea for 2 hours on a small uninhabited island – a dream, isn’t it?) and I saw a small national park on one of the islands, a park named Sv. Jerolim, and other small monuments with local importance. They have many national parks, the one I found to be the most beautiful was Plivitce Park. If you visit Croatia, you have to see Plivitce, or you`ll be coming back home without seing Croatia. So! Let’s imagine the shape of this country. A long and very thin coastline of 400 km, by car and drinving only on the main land. In the North, the coast opens into the interior of the country towards east, passing mountains and getting to Zagreb, the capital of the country. From Zagreb, you can travel even further east and get to the Serbian border. 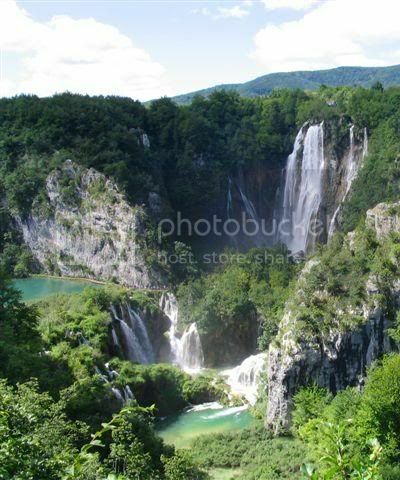 In the South-Eastern part of Croatia you find Bosnia. In the East : Serbia. In the North : Hungary and Slovenia, and if you take a small step through Slovenia, you’re in Italy, at Trieste (and if you’re cheeky, you can make another step and go to Venice). So, as you imagined, Croatia isn’t quite large, about 55,691 square km (just as you calculated, I`m sure) and about 4,4 milion people. Few, isn’t it? Wait and see what they can do. They are amazing. Most of them live in the North, in the low lands where they grow mostly corn. Another part of them work in tourism, on the coastline. The country is in full development. Everything is new. The country blossoms as we speak and there’s just a hand of people doing this : 4,4 milion. That’s it! Useless to say that in the tourist seasons, it’s hard to find a Croatian to talk to, the country is swamped with people of all nationalities. They come from Italy, most of them, because it’s close, beautiful, new and cheap! There are many tourists coming from Germany, too, Poland, France, United Kingdom (no! I`m lying, I haven’t seen much of those), Hungary (many, many), Slovenia, and i`m sorry to say, but in two weeks, I saw only three romanian cars. It’s sad, I know, so let’s move on. Why do these people impress me so much? Why does everything look so new? Sorry, why IS everything so new? Because in the period 1991-1995, this country was at war. In 1991, Croatia (that was a part of the Yugoslav republics) declared its independence, prompting Serbian invasion. Almost all Croats rose to defend their country under the leadership of its president, the late Franjo Tudjman (he died in December 1999), and after five years the country was liberated. Today, Croatia is a parlamentary democracy and it’s trying to get into NATO and EU as soon as possible. Actually, it seems, preliminary discutions will soon take place in the idea of Croatia joining EU. 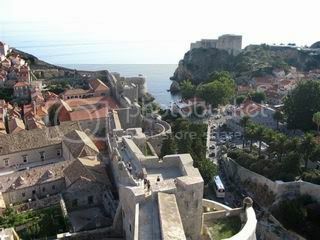 From the tourist`s point of view, I was wandering why wasn’t Croatia in EU already. Then I understood. The war left the country very damaged. The greatest support now is the new born tourism, and believe me, they know how to make a tourist feel like a king. Accomodations are cheap. The sites well advertised. They built highways all over the country. They blew up mountains for miles to build them. I had a map of Croatia that was 3 years old, we found many highways that didn’t appear on the map, not even as a pending contruction site. The country is moving very fast. It has things to show, to advertise and that`s what it`s doing. Croatia attracts people, and it’s worth it. The image outside it’s persistent with the image you receive inside : success guaranteed! As I said, their economy is based on tourism, that’s why feel free to get on the highway: trucks, or other gigantic transport machines, won’t get in your way because they don’t exist. The country`s resources consist of stone and rock digged in the mountains (Croatia is one of the world`s most profitable gritstone exporters), low lands have a small surface. They can’t carry an economy. Traces of war? Here and there. Usually you see them on old houses (in rural areas). There are traces of bullets that penetrated the walls. One night, I slept in a small town (in full development, too) and in front of the house I slept in, there was a street sign : it had 7 bullet marks on it. I was shocked. Everything around looked new and peaceful. If you want traces, you can find them. You could try asking the locals, too. They’ll tell you. The monuments along the roads tell you the same stories. All in all, I haven’t told you what I actually saw in Croatia. Beginning with the noumerous cities (that aren’t much to see, really), my love for ruins and castles was totally fulfilled. There are duzins of remains from medieval times. They are marked on maps and well preserved, I strongly advise you to see them. 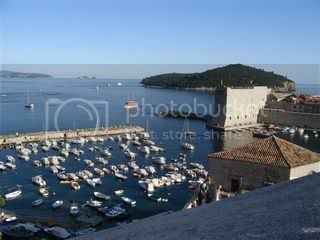 So, go to Dubrovnik (Southern Croatia). City walls 50 metres tall, 3 metres wide and 1,5 km long. A delight! The view is spectacular. 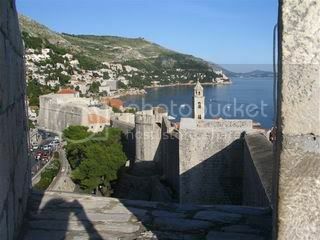 Dubrovnik has one knee on land and another in the Adriatic Sea. There’s a small port inside the city walls, an aquarium, many museums, three great churches from medieval times, and I won’t bore you with names, you have to see it for yourselves to be actually impressed. The port inside the city walls. More about sites in Croatia, later. This was only a general view. I`ll be back with details, places, and pictures.